I came to Vancouver last autumn. It was warm and rainy. There were lots of leaves with beautiful colors. They were everywhere around the streets. Most of the people are so helpful here. Sometimes, when I’m standing in the street, people ask me if I need any help. I had culture shock here. However, I felt much better after a month. I’ve been learning quickly about the city. I soon knew where I can go for shopping or for dinner. Now, I’m used to almost everything here. There are many things here that fascinate me, but my favorite is sightseeing. This is a city like no other! Vancouver is rich in natural beauty. I believe that the beauty of nature can have a profound effect on our senses. I made many international friends here. It is a good thing for me because I have experienced many different cultures now. 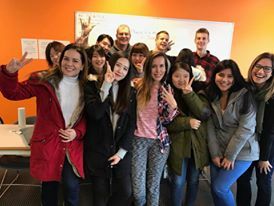 We always find different kind of activities in Vancouver and we have fun together, so we can always have different experiences. For example, I tried Korean food for the first time with my Korean friends last week and I liked it. We go to pubs, parties, trips and different kinds of restaurants. All of these are awesome memories. It is very special because you can only experience it once in your life. There are many things here that fascinate me, but my favorite one is sightseeing, and I would really recommend it. You can see the Capilano Suspension Bridge, Stanley Park, English Bay, Granville Island, Canada place, Whistler etc. I also like Robson Street.